Sweet 3 months old full blooded Siberian Husky puppies boy and girl ready to go Black and white very cute just few months old has all their shots is partially house trained likes playing with kids and cats very sweet doesn't bark alot much just needs to be re-homed i don't have enough time to give them a lot of attention due to my family problems. Only contact me if your serious about adopting this puppies their pics are posted on here so you can contact me through my email . I will forward their more recent pictures to you. They are definitely great Siberian Husky Puppies especially the girls. 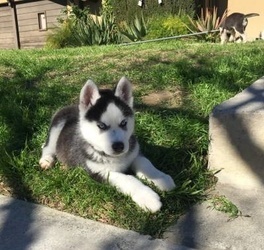 There are adorable Siberian Husky puppies looking for a great forever home. males and a females. they are very Loving, friendly and playful. Litter trained and eating solid food. Approximately 12 weeks old. Only serious inquiries please. yable and their spots are amazing with no bars.